2018 Asian Games opening ceremony in Jakarta. Sports in Indonesia are popular from both the participation and spectating aspect. Some popular sports in Indonesia are badminton, football, and the native Indonesian martial art Pencak Silat. Badminton is arguably Indonesia's most successful sport. Indonesia has won gold medals in badminton in every Olympic Games since the sport was first introduced to the Olympics in 1992 except in 2012 Summer Olympics. Indonesia is regularly a participating in Thomas Cup, Uber Cup, and Sudirman Cup Badminton championships. Indonesia is regularly participating in regional multi-events sport, such as Southeast Asian Games, Asian Games, and Olympic Games. In Southeast Asia, Indonesia is one of the major sport powerhouses in the region by winning the Southeast Asian Games 10 times since 1977. Sporting events in Indonesia are organised by the Indonesian National Sport Committee (Komite Olahraga Nasional Indonesia or KONI). The organisation, along with the Indonesian government have set the National Sports Day on 9 September. Indonesia hosts the Pekan Olahraga Nasional multi-sport event every four years. The participants of this event is the athletes from all provinces of Indonesia with hosting tally are distributed among Indonesian provinces. Nias' "leaping the stones" ritual. Pacu jawi, traditional bull race of Tanah Datar, West Sumatra. In traditional Indonesian culture, there is no actual concept for physical exercise as the counterpart of modern sport. Native Indonesians usually linked the physical activities to tribal practices; mainly for ritual, art, physical fitness and martial purposes. The war dances and ritual combat among Indonesian tribes are the earliest example of ritualised physical exercise in Indonesia. 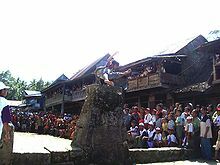 Some of native Indonesian rituals are resembling sport, such as lompat batu (leaping the stone) tradition among Nias male youth as part of coming of age ritual, that resembles hurdling and long jump in athletics. Also Madurese karapan sapi and Minang pacu jawi (bull racing) that are similar to chariot race. Dragon boat, canoe and kayak race are virtually everyday activities among Indonesians that lives on the bank of major rivers or on distant islands. In the 9th century the images of archery, described as princely court activities among nobility in ancient Java, can be found on bas-reliefs of Javanese candis. Archery is suggested as one of Indonesia's classical sport, and one of its famous rendering came from Prambanan temple as part of Ramayana story and later rendered as one of the icon of the Jakarta's 1962 Asian Games, also as the symbol of Gelora Bung Karno Stadium. 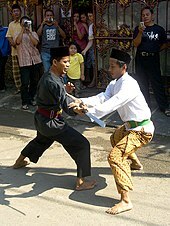 Pencak Silat is the example of Indonesian native martial art that turned into competitive combat sport. Several Indonesian dances demonstrated repetitive movements that similar to physical exercise. Indonesian traditional social dances such as poco-poco dance from North Sulawesi and sajojo from Papua are adopted as senam kesegaran jasmani (musical calisthenics) today popular across Indonesia. The modern concept of sport was introduced during colonial Dutch East Indies period. During these times football and badminton has reached Indonesia and become popular sport among Indonesian people ever since. After Indonesian independence, National Sports Committee of Indonesia was established in 1946 to unite the various satellite sports associations that was created within the regencies, then sports facilities were constructed in Indonesia, such as Ikada Stadium (1951—1962). During Sukarno reign, there is a desire to utilise sport as the means for uniting Indonesian people, establishing national pride as well as promoting sports in Indonesia. As the result the Gelora Bung Karno Stadium surrounded by sporting complex facilities were constructed in 1962 to host the fourth Asian Games held in Jakarta. Today in international stage, Indonesia is successful in badminton and also has been one of the major multi-event sports powerhouse in Southeast Asia. Many sports were imported, some were developed from native Indonesian traditional sports and became popular in Indonesia. Football has become the most popular sports in Indonesia since the country's independence, even though it had virtually no presence in the country before then. in Indonesia, this phenomenon is most often ascribed to general worldwide popularity of the sport, which carried over into Indonesia following its rapid urbanization. It is played widely, both professionally and as recreation. Indonesia Super League, the Indonesian domestic league is popular. Some of the major teams include: Persib Bandung, Persebaya Surabaya, PSM Makassar, PSMS Medan, Persija Jakarta, PSIS Semarang, Sriwijaya FC, Persipura Jayapura, Bali United and Arema Malang. The national body is the Football Association of Indonesia (PSSI). The Indonesian football league started around 1930 in the Dutch colonial era. In 1993, PSSI combined the existing 2 amateur competitions to be a single professional competition for football clubs, known as the Indonesian Football League (Liga Indonesia). Starting from 2008-09 season onwards, the competition format changed into a more common system that also being used in most European football leagues. The name also changed into Indonesia Super League. On the international stage, Indonesia experienced limited success despite being the first Asian team to qualify for the FIFA World Cup in 1938 as Dutch East Indies. In 1956, the football team played in the Olympics and played a hard-fought draw against USSR. On the continent level, Indonesia won the bronze medal once in football in the 1958 Asian Games. Indonesia's first appearance in Asian Cup was back in 1996. 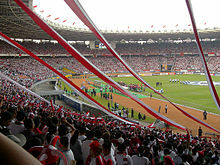 The Indonesian national team has always qualified for the Asian Cup in 2000, 2004 and 2007 AFC Asian Cup, however unable to move through next stage. Badminton is Indonesia's most successful sport. Indonesia has won gold medals in badminton in every Olympic Games since the sport was first introduced to the Olympics in 1992, except in 2012. In 1992, it came from Alan Budikusuma in men's singles, and Susi Susanti in women's singles. In 1996, Ricky Subagja and Rexy Mainaky got the gold medal in men's doubles. In 2000, Candra Wijaya and Tony Gunawan won the gold medal in men's doubles. In 2004, Taufik Hidayat won a gold medal in men's singles. In 2008, Indonesia won a gold medal through men's doubles, Markis Kido and Hendra Setiawan. In 2016, Indonesia won a gold medal through mixed doubles, Lilyana Natsir and Tontowi Ahmad. Indonesian badminton athletes have played in various international badminton tournaments in Indonesia, China, Korea, Denmark, Malaysia, Japan, England and many other tournaments, including Summer Olympics ever since the sport was introduced as a demonstration sport in the 1972 Summer Olympics and its official introduction in the 1992 Summer Olympics. Rudy Hartono is an Indonesian legendary badminton player, who has succeeded to win All England titles seven times in a row. Out of all participating nations, Indonesia won the most games in the Thomas Cup (Men Nations Badminton Championship), winning 13 out of 24. In addition to that, Indonesia won the Uber Cup 3 times. (Women Nations Badminton Championship). and Won Sudirman Cup 1 Times. (Mixed Nations Badminton Championship). also held its own international badminton tournament, the most prestigious is Indonesia Open that has been held annually since 1982. Basketball is one of the most popular sports especially among Indonesian youth. Liga Bola Basket Nasional is the pre-eminent men's basketball league in Indonesia, competed by 10 clubs across the country. The competition started as Indonesian Basketball League (IBL) in 2003. In 2010, Perbasi appointed DBL Indonesia to handle the competition and changed the league's name to National Basketball League (NBL). Today, Indonesia and the Philippines are the major basketball powerhouses in Southeast Asia. The Indonesia national basketball team's biggest success has been gold at the 1996 Southeast Asian Basketball Championship. On 9 December 2017, Indonesia was named as co-host of the 2023 FIBA Basketball World Cup, together with the Philippines and Japan. Although lately basketball has been proven as the most famous sport. Even their national team were able to be invited to several competitions. Several matches will be played in Jakarta. Additionally, is a whole basketball league dedicated to junior and senior students throughout Indonesia. This league is called DBL, which stands for Development Basketball League. Pencak Silat, an Indonesian martial art. Silat is an Indonesian native martial art, and Pencak Silat is an umbrella term for the indigenous martial arts created in Indonesia. The leading organisation of pencak silat in Indonesia is IPSI (Ikatan Pencak Silat Indonesia meaning Organization for Indonesian Pencak Silat). The liaison body for international pencak silat is the International Pencak Silat Association or PERSILAT (Persekutuan Pencak Silat Antara Bangsa). There is many perguruan (schools) and styles of pencak silat in Indonesia. Pencak silat has become one of sporting event in Pekan Olahraga Nasional and Southeast Asian Games with Indonesia as appear as one of the leading force in this sport. This martial art sport is also popular in Malaysia, Singapore, Thailand and Vietnam. Indonesia host some international road cycling tours; such as the annual Tour d'Indonesia, Tour de Singkarak and Tour de East Java. Inspired by European Tour de France, these tours is one of the esteemed cycling event in Southeast Asian region and has attracted local as well as foreign cycling teams. Tour d'Indonesia usually started in Jakarta, across inland Java all the way eastward to Bali, while Tour de Singkarak is held in West Sumatra touring around Lake Singkarak. In track cycling numbers, Indonesia is also one of the strongest in the region and often won gold medals in Southeast Asia Games. Indonesia have world class velodromes in Rawamangun, Jakarta; and Kutai Kartanegara, East Kalimantan, hailed as one of the best velodrome in Southeast Asia. For non-athlete common Indonesians, riding bicycle is considered as the mode of transportation as well as a recreational and leisure sport. It is quite popular in Indonesia, especially during Car-Free Days in several cities. During weekends, especially around Saturday and Sunday morning, cyclist flocking Jakarta's main avenue such as Jalan Thamrin and Jalan Sudirman that is closed from cars, municipal authorities invited locals to have their sports and activities on the street. The Bike-to-Work community was established in Indonesia in 2005 to promote cycling as a cheap, healthy, and environment friendly mode of transportation to the workplace. Extreme cycling, such as Mountain biking and urban Freestyle BMX is also popular among youth in main cities of Indonesia. Boxing is a popular combative sport spectacle in Indonesia. Some of famous Indonesian boxers are Ellyas Pical and Nico Thomas back in the 1980s, Muhammad Rachman and Chris John in the 2000s. Sepak takraw was spread from nearby Malacca across the strait to Riau islands and Riau area in Sumatra as early as the 16th century, where it is also called as Sepak Raga in local Malay tongue, at that time some of Sumatran areas were part of Malacca sultanate. From there the Malay people spread across archipelago and introduced the game to Buginese people in Sulawesi. Then the game is developed as Buginese traditional game which is called "Raga" (the players are called "Pa'Raga"). The "Raga" can trace its origin from Malacca Sultanate, and was popular in South Sulawesi since the 19th century. Some men playing "Raga" within a group, the ball is passed from one to another and the man who kicked the ball highest is the winner. After Sepak takraw was developed into modern competitive sport in 1940s with exact rules and scoring systems, Indonesia has become one of major sepak takraw power in the region, competing against Thailand and Malaysian teams. Polo and other equestrian sports have a deep history in Indonesia, dating back to the 1930s in the era of Dutch settlement. Once the effects of 1998 economic crisis faded away, this equestrian sport, especially polo gained recognition and excitement among Indonesia's polo, equestrian and sports enthusiasts. In Indonesia, polo is governed by the Indonesian Polo Association which stands together with PP. PORDASI under KONI. The Indonesian Polo Team represented Indonesia in the 2007 South East Asian Games in Thailand and had good results in South East Asian regional competitions. Indonesia only has one polo field at Nusantara Polo Club. SEA Games 2011 opening ceremony in Palembang, South Sumatra. The Pekan Olahraga Nasional (National Games) are held every four years. Indonesia also participates in international sporting events such as the Olympic Games (see Indonesia at the Olympics). the Asian Games and the South East Asian Games (SEA Games). 2018 Asian Games was held at Jakarta, Palembang, and some other venues in the provinces of West Java and Banten. On 8 July 2011 08:35am local time four Indonesian students have reached the peak of the Mount McKinley. So, the mission to scale all of the Seven Summits in Indonesia Seven Summits Expedition have been accomplished. All of the four students are the first Indonesians getting the title of the Seven Summiteers. ^ a b "Sports and Recreation". Archived from the original on 5 February 2006. ^ "A- FIRSTS". archive.org. 2 December 2008. ^ "IBL Becomes NBL" (in Indonesian). NBL Indonesia. 2010. Retrieved 30 May 2010. ^ Donn F. Draeger (1992). Weapons and fighting arts of Indonesia. Rutland, Vt. : Charles E. Tuttle Co. ISBN 978-0-8048-1716-5. ^ "Viva Borneo.com, Velodrome Terbaik Se-Asia Tenggara". vivaborneo.com. ^ "Permainan Sepak Raga". melayuonline.com. Archived from the original on 25 March 2014. Retrieved 1 September 2011. ^ "Sepak Raga, Permainan Tradisional Masyarakat Di Propinsi Kepulauan Riau". Archived from the original on 7 November 2010. Retrieved 1 September 2011. ^ "Permainan Marraga/Akraga (Bugis)". Melayuonline. Archived from the original on 12 April 2010. Retrieved 4 August 2010. ^ "History of Polo in Indonesia". wordpress.com. Archived from the original on 4 February 2008. Retrieved 26 February 2008. ^ "Nusantara Polo Club - Indonesia's Premiere Polo and Horseback Riding Club". www.nusantara-polo.com. ^ "TOP 5 INDONESIA SURFER ASIAN SURFING CHAMPION (ASC)". Retrieved 27 July 2018. ^ Post, The Jakarta. "Indonesian climbers accomplish mission over Seven Summits". thejakartapost.com. This page was last edited on 21 April 2019, at 17:25 (UTC).